Booth: "We'll continue to work on actions to improve profitability in Europe because we don't want to continue to lose money." DETROIT -- Lewis Booth, who retires April 1 as Ford Motor Co.'s CFO, said the automaker may lose $500 million to $600 million this year in Europe where the financial crisis is exacerbating industrywide overcapacity. "We'll continue to work on actions to improve profitability in Europe because we don't want to continue to lose money," Booth told reporters Wednesday in an exit interview at Ford's Dearborn, Michigan, headquarters. Ford will reduce the rate of European losses with better products and by "continuing to work on our cost base," he said. Good profit in North America should offset the European losses and provide "decent" results for years to come, Booth said. While noting that Ford's "fundamentals" may warrant a return to an investment-grade credit rating, Booth said the automaker may not reach that threshold this year. Booth, 63, became Ford's finance chief in November 2008, as the automaker was completing a year in which it lost a record $14.8 billion and its share price fell as low as $1.26. The shrinking market in Europe will force automakers to finally cut factory capacity there, said Booth, who ran Ford's European operations before taking the finance role. "The European overcapacity is well understood," Booth said. "We have to see some actions in Europe to reduce capacity." In 2009, Booth engineered Ford's largest debt restructuring, led the sale of its Volvo luxury line to China's Zhejiang Geely Holding Group Co. in 2010 and spearheaded restoration of Ford's dividend after a 5-year-suspension. Ford made $20.2 billion last year, boosted by a one-time gain of $12.4 billion, and it's within one level of an investment-grade credit rating. 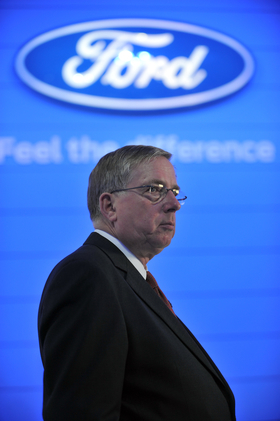 Before becoming CFO, Booth spent 12 years running Ford's regional carmaking operations, first in South Africa, then in Asia and finally in Europe. He engineered a turnaround at Mazda Motor Corp., at the time controlled by Ford, and overhauled the U.S. company's European car lineup. The son of a Liverpool, England, car dealer, he likes to drive a Transit Connect delivery van with racing stripes. "He literally knows how the entire Ford world works more than any executive we have in the company," Executive Chairman Bill Ford said in a 2009 interview. Ford has enjoyed a "fruitful" diesel-engine alliance with PSA/Peugeot-Citroen. On Wednesday, PSA announced an alliance with General Motors Co. GM is buying a 7 percent stake in PSA, and the two companies will cooperate on purchasing and product development, ultimately generating $2 billion in annual savings.